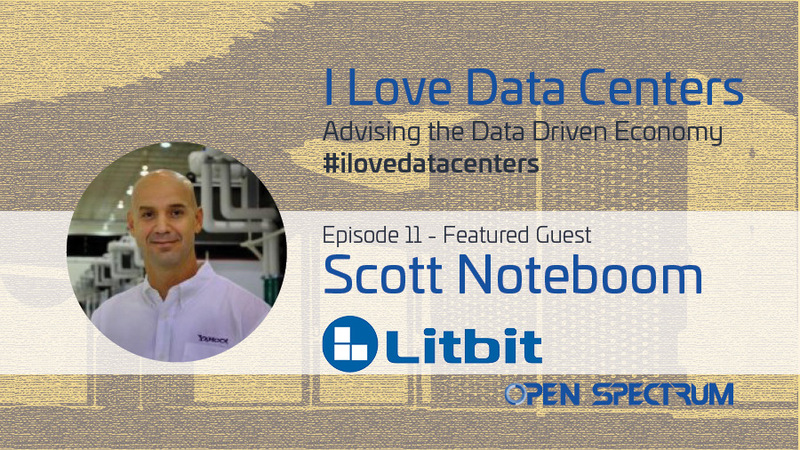 In this episode of the I Love Data Centers podcast, Data Center Patents and Perspectives on Artificial Intelligence, we have Scott Noteboom. Scott is the founder and CEO of LitBit, a company focused on making Artificial Intelligence (AI) a useful and practical tool for companies to leverage on a day to day basis, just as consumers use AI like Apple’s Siri or Amazon’s Alexa. Scott’s roots are in the data center, having worked for many years starting an ISP, working for an integrated voice and data startup and then joining the likes of Abovenet, Yahoo! and Apple overseeing data center engineering and operations. With a core background in software, his perspective on the industry is unique in that he’s always been working toward developing solutions that will make data centers smarter, and more importantly, communicate with one another intelligently. So, making the jump in 2013 toward developing an AI specifically for the data center vertical (among many other verticals) makes total sense. Our conversation explores primarily what AI is, and is not, along with some of the practical ways AI is being used today and will be used over the coming years and decades to come. Having accepted the reality that AI will play a large roll in our future as a species, I admire and stand behind Scott’s commitment to educating people on the topic and technology and also doing his part to ensure the technology is used for good. 3:28 Where are you right now? 4:41 Where were you born? 5:51 What was the earliest computer you had? 7:15 How did your education in technology play out? 11:02 Patents and data centers at Yahoo! 33:03 Is it risky using AI in a business? 45:34 What checks, balances, and controls can you put in AI? 55:07 Will machines and humans integrate with one another in the near future? 1:00:53 Where can people find out more about LitBit? 1:06:27 What is the backdrop to your laptop? 1:09:36 What an unpopular opinion you have? 1:11:08 What is a common misnomer about the industry?